Last month Cheap Sheds celebrated its 6th Birthday! And we are now looking back at our journey across the 6 years and how much we have achieved. “It’s amazing how time flies! 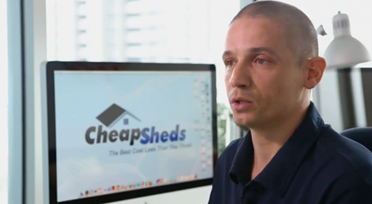 To think back to the time we just started our business, Maria and I, we never imagined we would become the super store we are today”, says Krisztian Panczel founder and Managing Director of Cheap Sheds. The company has grown from providing a few garden sheds to offering the biggest range of storage solutions online. Today the store include garages, workshops, carports, aviaries, dog kennels, gazebos, storage boxes and cabinets and even garden accessories! Since day one we have been fighting the industry against inferior imported products. People are always looking for a cheap deal online and are attracted to the super low prices the imported product offers, however little do they know it will arrive incomplete, of poor quality and likely to last no longer than a year. It is a disappointing experience for online shoppers hence why we continue to help people to spot the fakes and to make informed decisions when shopping online. Cheap Sheds was started with the view of revolutionising how sheds are sold and how customers are serviced and we have certainly managed to change the industry for the better and keep putting the standards higher and higher. Not only for ourselves, but for the entire industry. We received recognition by the Australian Government, Department of Communications for our achievement in providing Outstanding Customer Service. They conducted a case study into how we run our shop and why we are able to provide you the best service possible. Building relationships with the best of the best suppliers in the industry has always been our goal and we are happy to have such strong connections with not only the best suppliers in Australia but also internationally. This has enabled us to continue our promise to our customers to only provide top quality products, that are manufactured to very high standards. In 2012 we expanded into New Zealand. We took the company to a new country to spread our quality service. We connected and work with suppliers within the country who knows the market best. Mission accomplished! We even felt inclined to swap over to supporting the All Blacks at recent world events… as they kept impressing everyone while the Wallabies… just kidding. We have also become the go-to company for DIY storage solution advice. We built a library of useful videos, how to articles, tools and guides to help our customers find out more about our products, what they need for their storage challenges and assembly assistance. We invested heavily into making sure that our customers can find everything under one roof. Not only the widest selection of storage sheds on earth, but also every bit of information they require. Homes and living arrangements are always evolving, but people will always need storage for their belongings. Some homes often don’t provide enough safe and secure options, hence why we are always searching and adding new products to our range to ensure we have something for everyone. We are certainly proud to say, after 6 years of hard work, we are the leading online supplier of DIY storage shed solutions and we will continue to set industry standard for years to come.